If you’re like most people you just thought of a still-life head shot of Jesus, framed on a wall and looking into the near distance at something over your left shoulder. His hair is conditioned, his eyes are blue, and his skin is flawless. Clearly he uses only the best sunscreen. And moisturizer. If you’re like many people you’re thinking of Jesus walking through a field, or standing on a hill, or strolling by a sea, or on a sea, but not an ocean. You definitely didn’t think of him standing on a cliff, or walking up steps, or laying on his tummy with his chin in his hands, propped up on his elbows, girl-talk-sleepover style. Because nobody thinks of Him that way. Or maybe you thought of Jesus under a tree with a toddler on his knee, a la Santa Claus. Because to many of us, we like the idea that Jesus is like that favorite uncle who always has a half-dollar in his pocket with your name on it. I do a good deal of laughing. I once heard that good hard belly laughter equates to like half a sit-up. I don’t care much about that. I just love laughing. We don’t think about Him that way because the Bible doesn’t really talk much about Jesus’ funny bone. But there’s way more to Jesus’ life than what’s written down in the pages of the Bible. John 21:25 tells us that if everything Jesus did was written down, the world probably wouldn’t hold all the books that would be needed. And you’re gonna tell me that at least a big chunk of those volumes wouldn’t have been dedicated to Jesus’ supernatural humor?!? C’mon! The magi. I mean who brings a baby gold and spices? The drowned pigs. I don’t care who you are, demon-possessed bacon is hilarious. I’m not saying this to make light of Jesus or His life, or anything He did. Quite the contrary. I think we’d all do well to consider that Jesus way more than likely doesn’t fit into the tiny box we’ve got Him in. And maybe if we let Him out of the confined space we’ve crammed Him into, we’d see that there’s so much more to our Savior to celebrate, revel in, and even laugh with. I’ve said it before and feel free to chisel it on my tombstone: Those who follow Jesus are those with the greatest cause for hilarity in the entire world. No one should be laughing more than those who’s souls have been set free, those who’s sins have been forgiven, and those who walk with the One who owns it all. What do you think? Am I off my rocker? Have I gone too far? Did my foot slip into sacrilege? 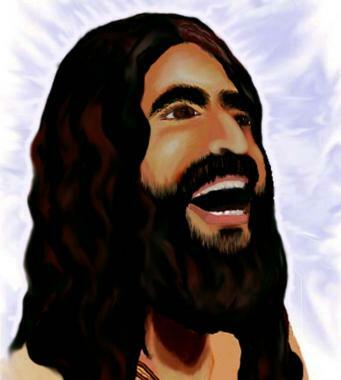 Just for fun, I looked everywhere for the worst picture of Jesus laughing I could find. Here it is. ← Anti-bullying campaigns are missing the point. Thanks Jim! And thanks again for your recent visit…the Lord had a powerful ministry here through you! Haha..thanks Mr. Faith! Great to hear from you. You’re on your rocker for sure. I enjoy thinking of Christ this way as well, although I hadn’t done it as in depth as you did. =) (and I LOL’d when I read the bit about “Pete”.) When something funny or silly happens to me I like to look up grinning and give Him the, “You enjoyed that, didn’t You?” because in my mind, he’s laughing at me tripping over the carpet or my own shoe, just like my husband does (thanks, hon! ), especially when there’s no one else around to witness the event. If He’s up there interceding on our behalf, grieving when we grieve, holding us close when life here on Earth is rough, He’s certainly laughing along with us, and probably at us, as well. Hey, son! Let me add my endorsement to this view of Jesus. Did you know that when Paul told the Corinthian believers that God loves a “cheerful” giver, he used the Greek word “hilaros”? Now what particular English word has that Greek root? Hmmm! Could it be? Keep up the good work! Love ya!